without two large, deep chromatophores on the ventral surface of the head. with 4-5 hooks (largest most distal) and 1 sucker proximal to large central hook on club. with about 50 on median portion of tentacular stalk. 46-57 suckers in proximal half of each arm IV. Clubs 20-36% of GL (25% in holotype). Club dactylus with 7-8 irregular sucker series at base becoming 4 series about half way out dactylus. Club ventral-marginal zone with 4 series of suckers in central region; medial suckers ca. one-half diameter of suckers in two marginal series. Largest suckers slightly smaller than largest arm suckers. Figure. Oral view of the proximal hooks and suckers of the medial zone and suckers of the ventral-marginal zone of the club of G. steenstrupi, fresh. Round structures are air bubbles. Photograph by M. Vecchione with transmitted light taken aboard the R/V G. O. SARS during the MARECO cruise to the central North Atlantic. Club dorsal-marginal zone with suckers in 4 irregular series. Club medial zone with large central hook; medium distal hook and proximal series with usually 4 small hooks and a sucker. Hooks decrease in size proximally. Sometimes the sucker replaced by 5th hook. Sometimes 6 hooks and rarely only 3 hooks present. Total number of suckers (excluding terminal pad, medial zone) on tentacular club: 190-225. Median region of tentacular stalk between marginal series with about 75-165 suckers. Figure. Oral views of the tentacle and club of G. steenstrupi, 94 mm GL, holotype. Top - Tentacle. Bottom - Enlargement of the tentacular club. Drawings from Kristensen (1981). Figure. 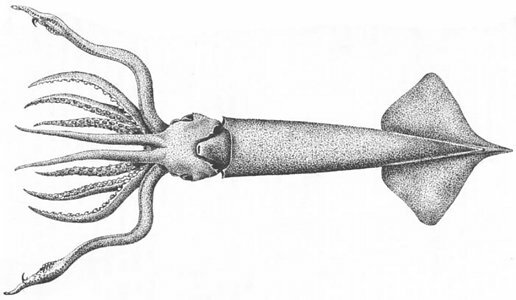 Oral view of a tentacular club of a late juvenile G. steenstrupi, alive. The proximal suckers are just beginning to transform into hooks. Photograph by . Radula: Lateral teeth of radula profiled by a ridge. Figure. Radula of G. steenstrupi, 57 mm ML. Drawing from Kristensen (1981). Figure. View of the funnel organ of G. steenstrupi, holotype, 94 mm GL. Drawing from Kristensen (1981). Two unusually large chromatophores absent from the ventral surface of the head. The above description, except for the photograph, is from Kristensen (1981). More details of the description can be found here. All of the above features are useful in separating G. steenstrupi from G. fabricii. However, the lack of head chromatophores and the presence of usually 4 hooks proximal to the large central hook of the club are the easiest to identify. 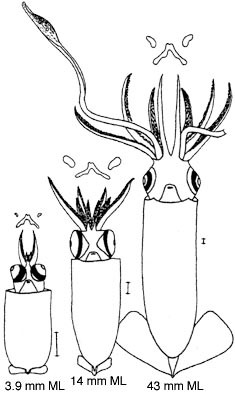 Paralarvae of G. steenstrupi are most easily separated from the partially sympatric species, G. fabricii by the absence of two large chromatophores on the ventral surface of the head that distinguish the adults as well. The number of suckers on arms I-IV is useful at sizes greater than 13 mm ML as is the form of the funnel organ in all but smallest paralarvae. The paralarval stage appears to end at about 20 mm ML which corresponds with hook development and movement into deeper water (Falcon, et al., 2000). Figure. Distribution of Gonatus spp. in the North Atlantic. Blue - G. steenstrupi. Red - G. fabricii. General map with dots and triangles from Kristensen (1981). Red and blue lines based mostly on paralarvae, from Falcon, et al. (2000). Falcon, L. I., M. Vecchione and C. F. E. Roper. 2000. 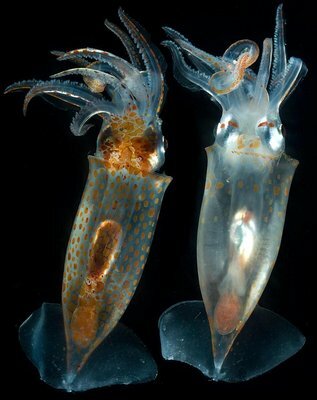 Paralarval gonatid squids (Cephalopoda: Oegopsida) from the mid-north Atlantic Ocean. Proc. Biol. Soc. Wash., 113: 532-541. Kristensen, T.K. 1981. The Genus Gonatus Gray, 1849 (Mollusca: Cephalopoda) in the North Atlantic. 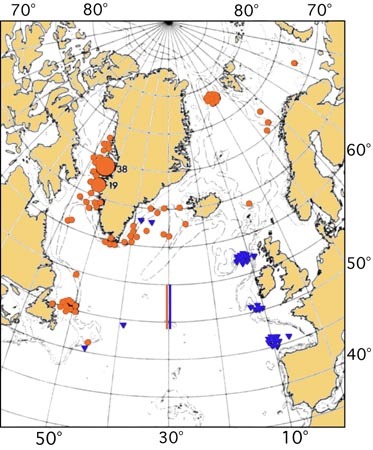 A Revision of the North Atlantic Species and Description of Gonatus steenstrupi. Steenstrupia, 7(4):61-99. Page: Tree of Life Gonatus steenstrupi Kristensen 1981. Authored by Michael Vecchione and Richard E. Young. The TEXT of this page is licensed under the Creative Commons Attribution-NonCommercial License - Version 3.0. Note that images and other media featured on this page are each governed by their own license, and they may or may not be available for reuse. Click on an image or a media link to access the media data window, which provides the relevant licensing information. For the general terms and conditions of ToL material reuse and redistribution, please see the Tree of Life Copyright Policies.